This is a perfect piece for any woman wanting to feel like a princess in the bedroom. The color is brighter and more sheer in person than it is in the photos, but it is still a good quality piece. The pretty lacing in the back allows for customized fitting, and the fabric is very flattering. It wasn't worth the price for me to have to forgive for the small disappointments, but it may just be for someone else. French Frills by Dream Girl is a 3-piece linger set featuring a chemise, matching thong, and removable garters. The stretch of the fabric and the lace-up closure in the back makes it adjustable to your unique size and shape. Feel like a princess in the bedroom while adorned with pink lace, ruffles, and rhinestones. This set is made of 90% Nylon, 10% Spandex. The mesh-y lace fabric is stretchy and not as scratchy as similar pieces tend to be. It is a pretty comfortable piece! The thong has a decent cotton liner, which is very much appreciated. You must hand-wash these pieces in cold water and allow to line dry (hanging up). I did notice that part of the lace on the bust had managed to come apart and a few threads out of place. These are very small details and would be easily be looked past since all I would need to do is snip the threads. It was a disappointment to me, though, because the rest of this seemed like great quality. The rhinestone detailing on the cups are merely glued on, but I did not notice any missing or coming undone. I tugged on a few and they seem pretty secure. 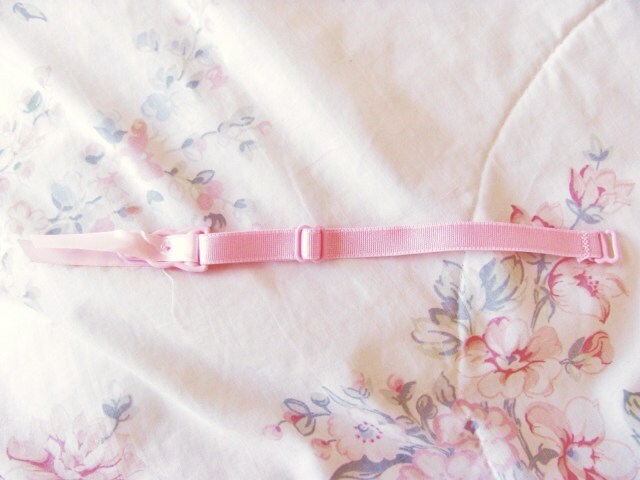 The garters and shoulder straps are made of thick, highly durable elastic and the garters have strong, pink-coated hooks. These are different than the garters that appear on the DreamGirl model, which I found to be odd, but the ones I got are much cuter. There was another big difference between this product in real life and what it appears to be from the photo: the color. In the photo provided by DreamGirl, this is baby pink, only slightly sheer, but with more opaque in the cups. In real life, this is much brighter (it's still light pink, but...neon baby pink, maybe?) and much more sheer. The cups are no exception, as they are just as sheer. It is still pretty, but was not what I was expecting at all-- at first sight, I admit I was a bit disheartened. Upon taking my own photos, I discovered that the shade of pink is a little difficult to capture, and I found myself a little bit forgiving of difference in the site-provided photo. I apologize that this is not exactly true to life. I purchased a size small. I am pleased to report that the length of the chemise on me was what I had expected from the photo provided by DreamGirl (I'm of an average height at 5'5"). The material on the cups is tight in its relaxed state, but very stretchy, so it will fit even the smallest busts. I'm between an AA and A cup, and the cups were not saggy for me. You have no idea how big of a feat that is. I feel that these would best fit up to a B and no more than a C.
I found this piece to be very form flattering due to the elasticity of the stretch. It fits comfortably and smooths out curves without extenuating "problem areas" such as the tummy or love handles. The thong on the small measures 7 inches long in the front, the band measures 13 inches (laid flat) in its relaxed state and stretches to 22 inches. For the chemise with the ribbon laced completely tight, this measures to: 11 inches underbust, 11.5 inches waist, and 14.5 inches in the hips. Unfortunately, you cannot loosen the ribbon to its fullest potential because there is an elastic band at the top that barely stretches a full inch. The fullest measurements are as follows: 12 inches underbust, 13 inches at the waist, and 18 inches at the hips. The fabric can be stretched comfortably to about 1 to 2 extra inches max. Honestly, I'm a little torn on whether or not I'm happy with this piece. I was excited to get it because of how it looked on the model. Now I have learned the lesson that items seen on models are not always as they appear in person. It's not that the color is terrible, or that this is a bad piece in any way, but I had my sights on this for very specific reasons. I am pleased that it actually fits, and that it is comfy, but that's about it. I'm not sure at this point if I'm going to keep it, but I'm going to give it some time to mull over. It's definitely a cute, fun piece, with pretty nice quality; I definitely recommend it if it sounds more to your liking than mine. In the end, I'm just not sure I could justify the price tag and keep it despite my disappointment. This is a 3-star product for me: I'm not in agreement with the price in correlation to the quality I received (though it is not bad quality), and the discrepancies. Great review and I loved your pics! Thanks for the review and the pics! The sizing chart is helpful too. Thank you for viewing French frills garter slip and thong – chemise review page!